WITH the politics and politicians of Northern Ireland occupying centre stage during the Brexit crisis, the latest book from a University of Huddersfield professor and his co-researchers is the most detailed investigation yet published into the membership and the attitudes of one of the Province’s longest-established and formerly most powerful political parties. For decades, the Ulster Unionist Party (UUP) was the dominant force in Northern Ireland, leading every Stormont government from 1922 to 1972. Its former leader David Trimble won a Nobel Peace Prize. But it would be eclipsed by the rise of the Democratic Unionist Party, founded in 1971 by Ian Paisley. The DUP – crucial to the survival of Theresa May’s Government – was the subject of an earlier book, entitled The Democratic Unionist Party – From Protest to Power – by James McAuley, who is Professor of Political Sociology and Irish Studies at the University of Huddersfield. 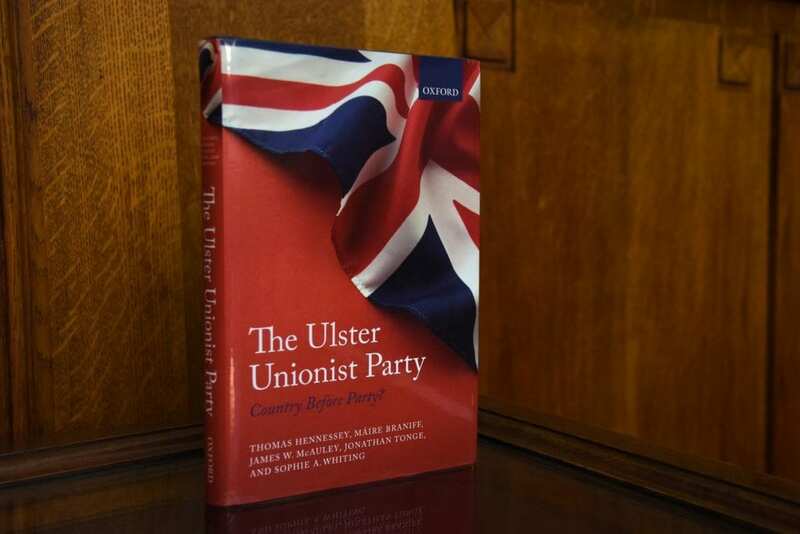 Now, he and his colleagues Thomas Hennessey, Máire Braniff, Jonathan Tonge and Sophie A Whiting, who hold senior posts at a range of universities, have researched and written their follow-up, The Ulster Unionist Party – Country Before Party?. Based on a survey of almost half the party’s 2,000 membership, plus a large number of detailed interviews, it provides the most comprehensive current and historical account of a party that was long the most important in Northern Ireland. The book has been welcomed by the current leader of the UUP, Robin Swann. In a newspaper article, he stated that “people have made assumptions about our members’ views, but this the first time that anyone has taken the time to research exactly what they think”. And he took the opportunity to affirm that while he is leader there will be no merger with the DUP. Professor McAuley said that there had been surprisingly little research on the UUP over the past 30 years. “They won every election contested in Northern Ireland from 1922 to 1972, when Stormont was prorogued. Then they were slowly but surely overtaken by the DUP, which better articulated the fears of many people within the Unionist community. “For a long time, the UUP were thought of as ‘Big House Unionism’, where the leaders were felt to belong to a different class to most of the voters,” said Professor McAuley. The UUP now presents itself as a more moderate Unionist party. It has broken historic links with the Orange Order and has tried – with limited success – to attract a larger Catholic membership. Professor McAuley and his colleagues were able to contact a large proportion of the current UUP membership, gauging their attitudes on a spectrum of political, religious and social issues. The result is a collaboratively written book of nine chapters that covers topics including the UUP during the Troubles; Britishness and the Union; Religion and the UUP; and the role of women in the party. The book’s conclusion speculates on the future of the party. Now that Professor McAuley and his colleagues have completed books about the two major Unionist parties in Northern Ireland, they aim to shift their attention to the liberal and centrist Alliance Party and the nationalist SDLP – and maybe Sinn Fein in due course. This would require access to the membership. “We are hoping that good things said about the two books we have published so far will convince the other parties that it is a worthwhile exercise,” said Professor McAuley. * The Ulster Unionist Party. Country Before Party, by Thomas Hennessey, Máire Braniff, James W. McAuley, Jonathan Tonge and Sophie A. Whiting is published by Oxford University Press.